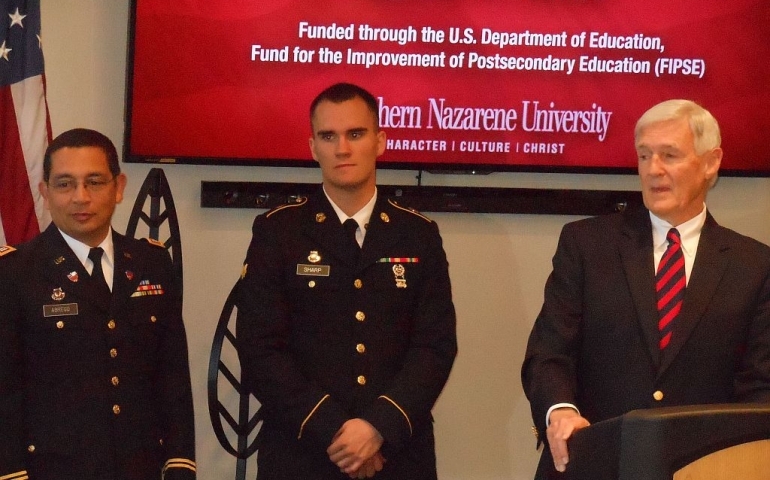 On Veterans Day, Wednesday Nov. 11, 2015, Southern Nazarene University held a press conference to announce the receipt of a $330,000 Centers of Excellence for Veteran Student Success (CEVSS) grant. The purpose of the grant is to directly support the SNU veteran population on its Bethany campus. The grant will be used to create and fund a Veterans Educational Transitions Success (VETS) Center, add a coordinator position for the center and to develop a support team for veterans that will reach across the Bethany campus and into preexisting campus offices. At the press conference Dr. Melanie Kyzer, Vice President of Academic Affairs, described the VETS Center as “a single point of contact to work with faculty, staff and the community to comprehensively address the needs of veteran students, and help them as they transition into the academic community.” Kyzer went on to explain that the VETS Center’s programs would also emphasize veteran student outreach, recruitment, veteran specific orientation events and social support not just for veterans but also their families. In addition to the grant, the press conference stressed SNU’s military friendliness. All SNU educational programs are Veteran Affairs (VA) approved and offer American Council on Education (ACE) credit for military training and experience. Dr. Gresham also announced that the Veterans Affair Coordinator position, currently held by Dayna Stark, would soon be filled by Darrell Buck. Buck is currently a Staff Sergeant in the U.S. Army. Out of the 13 CEVVS grants issued, Southern Nazarene was the only recipient in the state of Oklahoma. In addition to the grant, SNU will contribute an additional $39,000 to help fund the CEVSS program. SNU will be the only institution in the state to have a federally funded Center of Excellence for Veteran Student Success. As SNU enters into 2016 its commitment to America’s veterans continues to increase. Next PostHow to Survive Your 8 a.m.